Freedom National is a groundbreaking history of emancipation that joins the political initiatives of Lincoln and the Republicans in Congress with the courageous actions of Union soldiers and runaway slaves in the South. It shatters the widespread conviction that the Civil War was first and foremost a war to restore the Union and only gradually, when it became a military necessity, a war to end slavery. These two aims-"Liberty and Union, one and inseparable"-were intertwined in Republican policy from the very start of the war. By summer 1861 the federal government invoked military authority to begin freeing slaves, immediately and without slaveholder compensation, as they fled to Union lines in the disloyal South. In the loyal Border States the Republicans tried coaxing officials into gradual abolition with promises of compensation and the colonization abroad of freed blacks. James Oakes shows that Lincoln's landmark 1863 proclamation marked neither the beginning nor the end of emancipation: it triggered a more aggressive phase of military emancipation, sending Union soldiers onto plantations to entice slaves away and enlist the men in the army. But slavery proved deeply entrenched, with slaveholders determined to re-enslave freedmen left behind the shifting Union lines. Lincoln feared that the war could end in Union victory with slavery still intact. The Thirteenth Amendment that so succinctly abolished slavery was no formality: it was the final act in a saga of immense war, social upheaval, and determined political leadership. 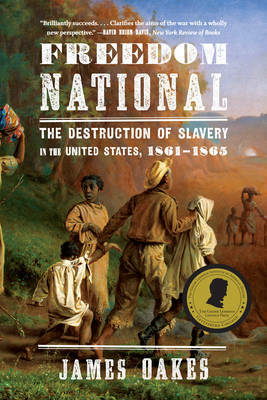 Fresh and compelling, this magisterial history offers a new understanding of the death of slavery and the rebirth of a nation.